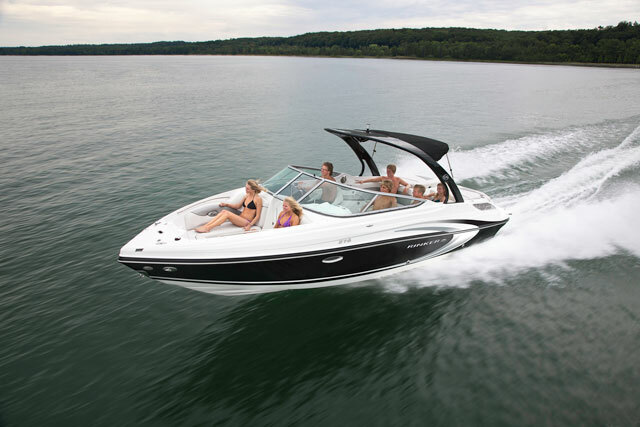 The Rinker Captiva 236 BR keeps up this company’s long tradition of building runabouts the entire family can enjoy. 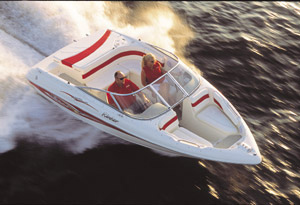 Tour the Rinker manufacturing plant and you’ll see workers moving about with a sense of urgency yet little fuss, quietly getting the job done as they build bowriders and cuddy-cabin cruisers. That says a lot about the company’s plant, which in turn says a lot about its products. 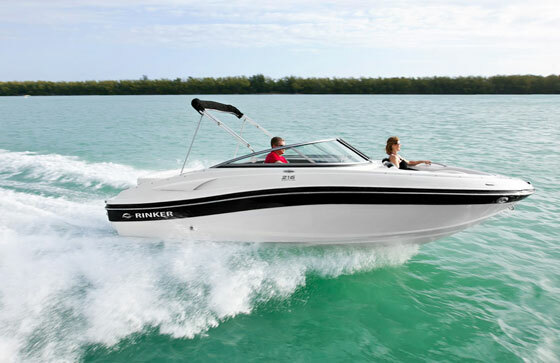 The oldest American boat brand in continuous production, Rinker boats have been bringing families together out on the water, quietly getting the job done since the 1930s. 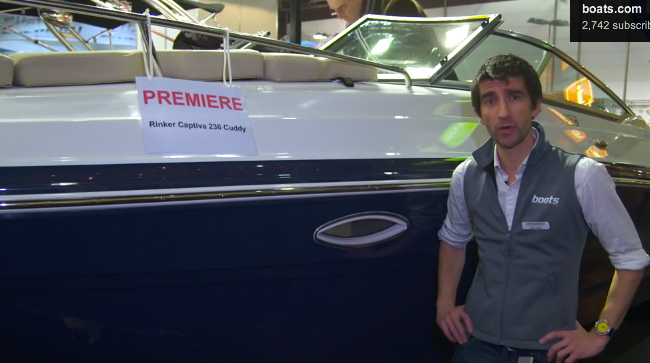 Rinker debuted the 236 BR, a step up in the model line from the popular Captiva 216 BR, for the 2013 model year - and it's been enhanced for 2014. The boat itself comes nicely equipped in standard trim, but we bet a lot of them are going to be ordered with the R package, which includes big-ticket items like a folding tower with speakers, a Bimini top, and custom hull-side graphics. 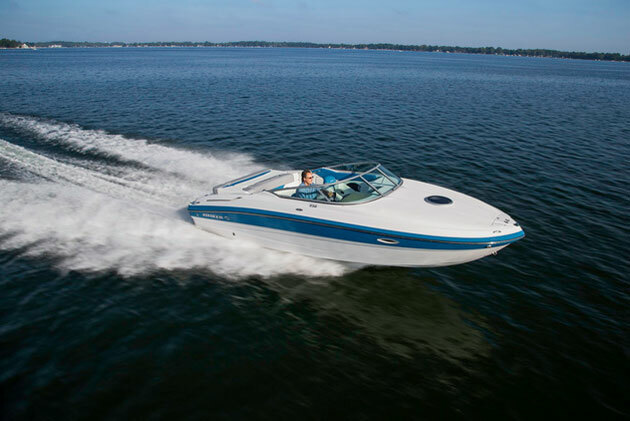 The R package also comes with a watersports mirror, a subwoofer, transom audio controls, satellite radio, halogen swim light, a bow scuff plate, a color matched helm and a dual-battery system. You might not want to pay the upcharge, but your kids will insist. In standard trim, (which has a base MSRP just over $57,000, with a 270-horse Volvo-Penta V8 and single-prop drive) it’s plenty plush. For instance, the swim platform is set up with a walk-through to the cockpit. The walkway is treated with nonskid and is fitted with a removable stowage bin under it. When not in use, an upholstered cover lowers to create a full-width sun pad. Skiers can sit on the sun pad as they gear up for their run. When they finish, the concealed three step boarding ladder makes egress from the water a breeze. They can stash all their wet gear in the generous in-sole locker, which is treated with gelcoat and has a mesh rubber mat on the bottom. The lid is supported by a gas strut so you don’t have to hold it up while you stow your gear. The standard carpet is snapped onto the locker door and at key locations throughout the cockpit. 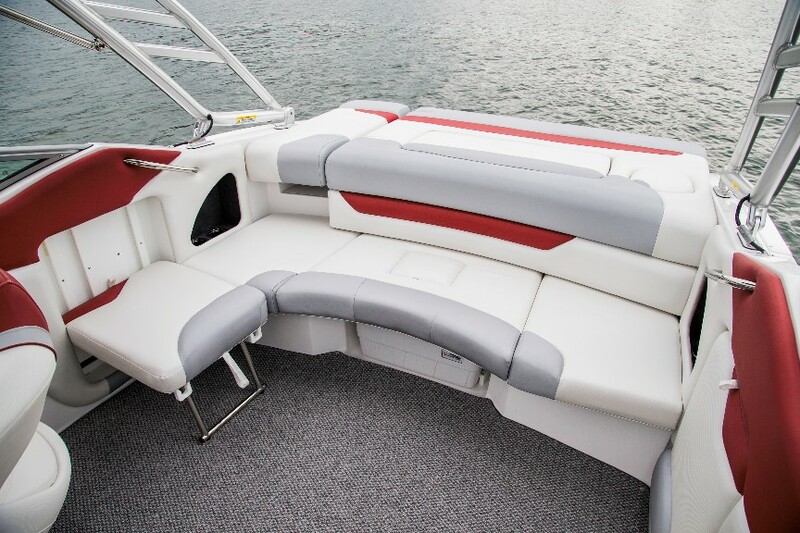 In standard trim, there’s ample seating and stowage on the Rinker Captiva 236 BR. Under the rear bench lies a removable Igloo cooler, with additional stowage bins to either side. However, we really liked the optional “rumble seats,” which fold up into the coaming panels when not in use. It’s a clever design that works well. We also liked the helm, which reflects the welcome trend away from faux woodgrain panels. It’s simple and straightforward, with easy-to-read black-and-white Faria gauges, two rows of rocker switches, and a control station for the Sony stereo and a trick-looking Isotta wheel. There’s also a 12-volt power outlet. To port and to starbard, and each swivel bucket seat features a flip-up thigh bolster—something that is often included only for the driver. Up front, the Captiva 2356 BR eschews the current trend toward pickle fork designs in favor of a traditional pointy bowrider bow. But designers still managed to carve out a lot of space up front. It’s reasonably deep, coming up to about the middle of your back in the very front. The lounges are comfy, too, with gently angled backrests and grab rails that fall naturally in hand. Those grab rails also are tucked in so as not to spoil the clean profile of the boat. Rinker even included stowage behind each backrest, too. There is a running joke in the writing and editing business, which goes something like this: I’d rather have a good writer that gets the job done on time every time than a spectacular writer you can’t rely on. The workers in the Rinker plant in Syracuse, Ind., are kind of like the former. 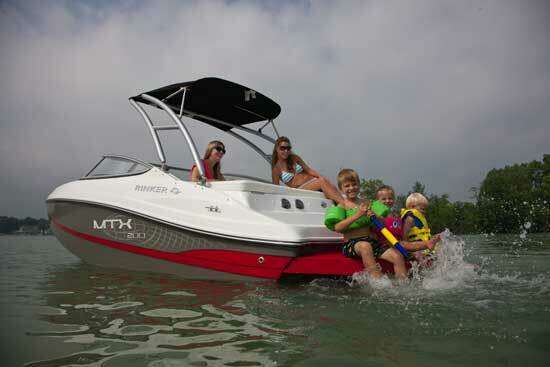 They are producing good boats on time every time—which is just what you need when the family wants a new bowrider. 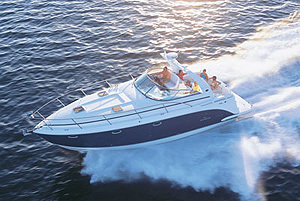 You can find Rinker bowrider listings here. For more information, visit Rinker.